The roots of this cake lie in Germany. It was named after the Schwarzwälder Kirsch (Wasser) the famous liquor found on the mountain range in south-west Germany. Cream, cherries and Kirsch were first served as dessert. It’s the presence of alcoholic content and the cherry that gives this cake the different flavor. According to some name is inspired by the traditional outfit of women of Black Forest region. With the traditional outfit, women have hats on which there are hanging pom-poms. This brown dress resembles the cake and the pom-poms on the hats are the cherries. Black Forest Cake has certain layers of chocolate sponge. All layers are whipped frosted with whipped cream and cherries. The whole cake is iced with a huge amount of whipped cream, chocolate shavings and cherries. No alcohol is present in Indian Black Forest Cake. Basic ingredients present are butter, sugar, flour, chocolate, cream and the delicious cherries. 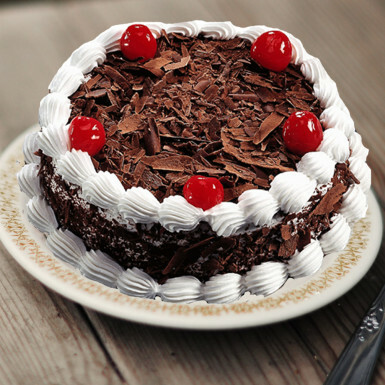 Eggless black forest cake is also available and for this you have to click on checkbox button . Simple yet the elegant appearance makes it the cake for same day delivery. Chocolates are everybody’s best friend and when they are mixed with cherries and cream makes it daintier. This Black Forest Cake is fit for every occasion. You can order this cake for birthdays, anniversaries, office parties, get together or goodbye celebration. Different variety .. good service.. Otherwise a good choice to go for.